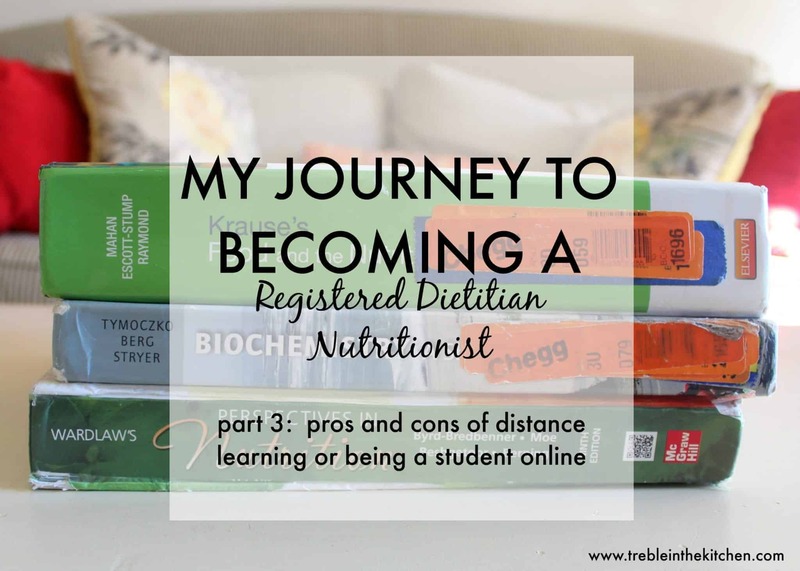 If you have read the other posts, you know that I am becoming a Registered Dietitian Nutritionist in a very non-traditional way. The program that works best for me and my life is a distance program, which means that all of my courses are online. I never set foot in a class room, discussions are kind of like chat rooms, and I Skype with my teachers for office hours. While this may sound a bit dreamy at first, I’ll be honest in saying that there are definitely some negatives to the whole going-to-school-online thing. Because I’m a positive thinking person, I’ll start with the pros list first! This really is the best benefit. I love that if I have some extra time, I can work ahead a bit. If I have the work done and I’ve turned in the assignments I don’t have to just “go to class anyway” because that’s what my course schedule says I have to do. That means there is no attendance and I can basically do my work in my jammies. The schedule flexibility has allowed me to work part time, volunteer for organizations outside of school, be part of a singing group, continue blogging, teach group fitness on the side, travel, and meet with people in the Denver area during the work week. This pro has also allowed many of my classmates to maintain full-time jobs and raise children while working to become an RDN. This may seem like a weird benefit, but when I was in the working world I almost never showered at home during the week and typically at breakfast and lunch (and sometimes dinner) on the run while going to work or at work, in a meeting, etc. I really enjoy the fact that I can eat at my table, fix what I am in the mood for at the time that I am hungry and that I can shower in my own shower. Yep, it’s the little things! While I am completely loving my journey to become an RDN, I’d by lying if I didn’t tell you about the tough times. There are many days when it feels like “I’m the only one out there.” I typically feel this way 1-2 times a month when things get really busy (like before a test, or when a lot of projects are due at the same time). It’s really difficult not being able to commiserate with others in my program (in person) on a regular basis, meet for study groups, and just TALK things out and truly discuss what we are learning. Luckily, I nanny in the afternoons, I take Bernie on walks, workout at a gym, and set up friend dates for myself so I at least SEE other people occasionally. Kind of. With each course you take, there is a professor assigned to you. Some are really great and they respond to your questions right away (I’ve been known to be quite the question master), offer office hours, will meet with you (if you live in the same area), and will really help you through the process of learning the material. Unfortunately, most of my experience with distance learning and online courses has not been that positive. Typically, you are given a syllabus, possibly some power points that may or may not be helpful, a list of assignments and tests with due dates. It ends up being a lot of reading from the book, google searching for videos that give a deeper explanation of the topic, and chatting with other students about how they have no idea about what is going on or what to expect on the test either. All of that being said, the courses that are part of my nutrition program have been great. It’s all of the prerequisites that I have to take through other institutions that are not so great. *If I’m looking at the sliver lining here, this has really taught me more about my learning style which is helpful for future opportunities! This can totally be on the pro list, but at the same time I think you may understand why it’s on the cons list too. If you are the type of person that doesn’t really work well on your own, needs constant outside support from others, and must be pushed in order to succeed then taking classes online and being a distance student may not be the best choice for you. 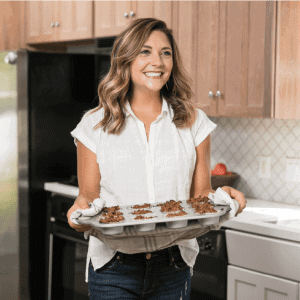 On the other hand, I have been told by professionals in the nutrition field (and others) that completing a non-traditional program that requires the individual to piece together several parts of the puzzle truly demonstrates something outstanding that will set us apart from others when applying for internships, jobs, etc down the road. Feel free to shoot me an e-mail or comment below! Any work from home or online students reading? If so, what are some of your pros and cons? Thank you for this blog, I’m kind of thinking of becoming an RD and I was trying to learn how to become one when I end up in to your blog. As you posted this in 2016, I was wondering if after your studies you struggled finding a job and are you still working as an RD. Thanks for reaching out 🙂 I actually had no issues finding a job and had offers before I even completed my internship. That being said, not everyone in my program had that same experience. My best advice is to work hard in every single rotation, constantly network in your community and online, and be grateful for the entire process 🙂 Wishing you the best of luck!!! Do you think the prerequisite courses are more challenging (in regards to content) than the nutrition classes in the major? I am a Special Education teacher and I’m looking for a second career. I’ve researched the RD programs and I must say, I’m very worried about whether or not I have what it takes to make it through those classes. I mean, organic and biochemistry? YOWSERS. I’ve been enrolled in an online Masters of Social Work (MSW) program for the past two years and will graduate in August 2017. I completely agree about your pros and cons. Sometimes, I can be very motivated to get work done while other times I’m tired from going to work and doing my internship. I do miss the interaction with my peers, but we have discussion boards to talk about the lesson for the week. One thing you didn’t mention and I’m not if it happens to you is that some people feel that online schooling is easier than traditional schooling. I disagree because I still have to read the material and complete assignments like them. The only difference is that I don’t sit in a classroom on a weekly basis. Hey Cicely, I totally agree. No one has really told me that they thought my classes were easier, but I am totally on the same page with you. They are NOT easier than courses I took in person for my undergraduate degree. In many ways, I think we could argue that there are many components making these courses harder. Good job on working towards your masters 🙂 Good luck as you push through you last year! I have 3 online classes this semester and I definitely agree with you on your pros. I am good and staying organized and self motivated so that’s not a problem for me. I agree with you on the isolation part, sometimes I wish I had more in person classes just for the interaction aspect. Yes, it’s so hard being at home alone all the time. I really have to make an effort to meet with people on a regular basis. I took most of my graduate school classes online (health promotion and education) and can totally relate to all the pros and cons you listed. I loved the flexibility and not having to get ready each day, but I did miss the interaction with my classmates. I met some other peers through the program and we met up weekly to study or work on homework, which was so nice so it ended up being a happy medium for me. Sounds like you had a great balance! I don’t know if I told you, but I start holistic nutrition school in January. I decided that the holistic route was best for me and when I’m done I may start an RD track but I could not be happier with my choice to go to school to learn about something I love so much. As far as distance learning, I am finding out that it can as you stated feel very isolating. I’m hoping to find some part time work so I get out more other than to the gym and grocery store. I miss the interaction with the students in the class too. While it’s very convenient, it has it’s negatives. That is so amazing, Megan!! Congratulations!! 🙂 The holistic route is so fascinating to me. What program are you going through? Totally agree with your pros and cons. At least it’s temporary though!